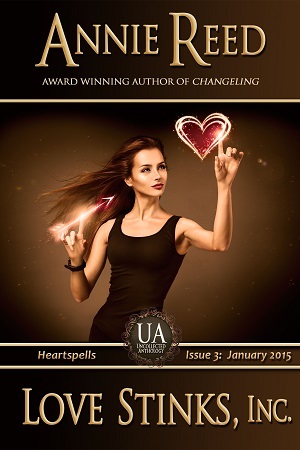 This week’s free fiction story celebrates the first issue of the Uncollected Anthology with my contribution, The Magic of Home. This story will be available to read for free right here until August 15th. Enjoy! The motorcycle whispered to Twig as they zoomed past the shipyards at the south end of Moretown Bay. 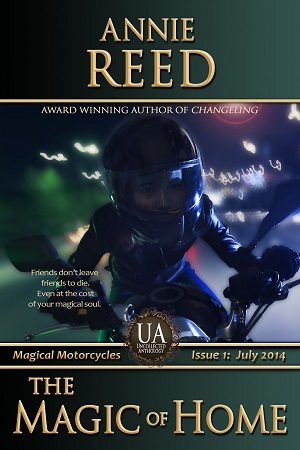 Tucked safely inside her helmet, the tips of Twig’s long ears quivered in response to the motorcycle’s rumbling voice. She felt its yearning not only in the subtle change in its magic, but in the throaty roar of the engine as they increased speed, racing north on I-5 toward the city that shared its name with the bay. Her words tore apart on the damp night air rushing past her, but she knew their meaning would still reach the heart of the machine that had been her friend for a decade. Not all magical beings needed ears to hear or words to understand. As much as she wanted to get them both home, they couldn’t afford to draw the attention of any police—or wizards—who might be patrolling the freeway. I-5 passed through the center of the city as the freeway wound its way north into Canada, a wide ribbon of asphalt and concrete hemmed in by high-rise office buildings, luxury hotels, and apartment buildings too rich for Twig’s blood. This part of the freeway had always been heavily patrolled. Twig doubted that had changed in the years she’d been gone, so she throttled back on the engine to bring their speed closer to the surrounding traffic. The motorcycle fought her, so Twig whispered soothing words to it until it accepted her decision. She hoped it was the right one. Under other circumstances, just seeing the city itself might have taken her breath away. Tonight the sky was clear. No fog had rolled in off the water to obscure the view, and the tall buildings in the city center gleamed like jewels against the starry sky. She could make out the spires of the Justice Center, gleaming white and silver like a monument to law and order for all, human and magic folk alike. Spotlights had turned the modern glass and steel Trexler Towers blue and green, the colors for a local sports team. Twig wasn’t surprised that the city was still celebrating the team’s world championship, even though that particular sport wasn’t truly played on a global scale. Everyone, magic folk and humans alike, needed something outside themselves to believe in. Hurry, the motorcycle whispered. Gillfoil approaches. Twig tensed. As sensitive as her ears were to the currents of magic in the world around her, the motorcycle’s senses far exceeded hers. If the motorcycle felt the presence of the gang’s enforcer, that meant he was near. Behind. Less than a mile. The motorcycle hesitated. Twig could imagine her friend calculating speed and distance, and the effect of mass and magic on both. The Magic of Home is available for purchase on Amazon, Barnes & Noble, Kobo, and Smashwords. 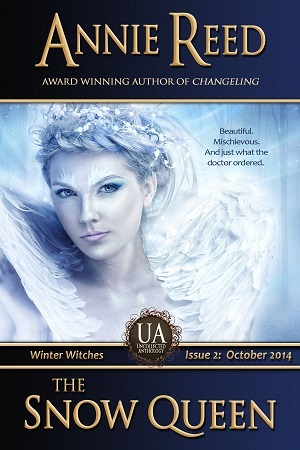 If you enjoyed this story, be sure to check out the other stories in the Uncollected Anthology series!